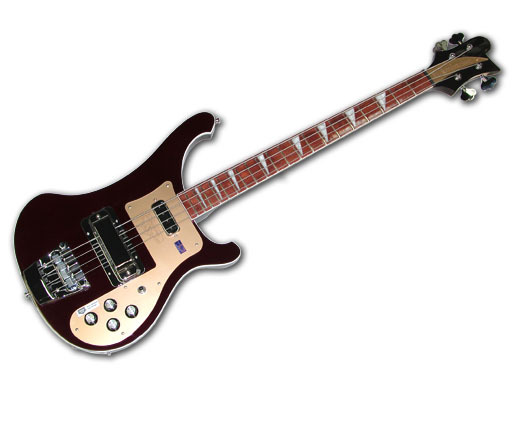 Rickenbacker International Corporation is pleased to announce four limited edition guitars to commemorate the 75th anniversary of both our company and the electric guitar itself. These instruments will feature a special finish (Dark Cherry Metallic), a gold pickguard with a unique 75th anniversary logo, and a matching gold nameplate. Featured in this limited run of 75 guitars per model will be the Model 330, 360, 660 and 4003. Orders for these instruments were taken beginning at 8:00 AM Pacific Time on September 1, 2006 and SOLD OUT by noon. 60 units of each type were available for sale in North America, the remainder were allocated for export. No 12 string or left-handed orders were taken in this series in order to expedite delivery.